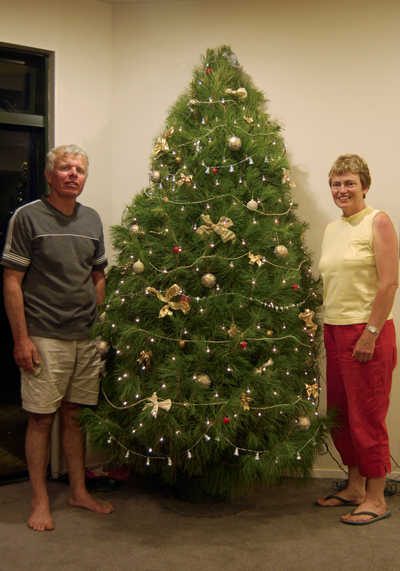 Situated beside the Kaipara Harbour, Noel and Janet Higham run a beef farm in South Head. During the early 90s, they planted 3,000 Christmas Trees by hand, with the anticipation that it would be a suitable money earner for their children. They quickly realised the demand for the trees was substantial and kept growing. Each year they planted more and more trees to keep up with demand, with over 40,000 trees now being planted each year. Over the years Noel and Janet have improved their systems and mechanised where necessary to ensure greater efficiency and a higher quality tree. They have designed and built their own planter and an elevator system to ensure loading of each truck is easier and with less damage. With over 20 years experience they have learnt to understand the trees better. They are always on the lookout for disease and insect damage and have refined the trimming and shaping process, resulting in a beautiful tree. Noel’s Christmas Trees constantly strive to deliver the best possible trees through innovation and experience. Wishing you a wonderful and meaningful Christmas.